Actor and model who gained visibility among American television audience for his role as Damon Salvatore in The CW’s supernatural drama The Vampire Diaries. The blue eyed debonair has also starred as Boone Carlyle in the TV drama Lost and appeared in many films including The Anomaly, How to Make Love to a Woman and The Tournament. Ian Somerhalder was born on 8 December 1978, in Covington, Louisiana, U.S.
He’s currently 40 years old. His ancestry is French English, Irish and Choctaw. Ian went to St. Paul’s, a private Catholic school in Covington and then attended Mandeville High School, a public school in Mandeville, Louisiana. Somerhalder married actress Nikki Reed on April 26, 2015, in Malibu, California. They welcomed their child, a daughter, Bodhi Soleil, on July 25, 2017. Before marrying to Nikki, he dated his The Vampire Diaries co-star Nina Dobrev from 2010 to 2013. He wears a size 9 (US) shoe. Ian Somerhalder made his onscreen acting debut in the year 1998, with the film Celebrity, in which she played a minor role. His first leading role was in the film Pulse where he played Dexter McCarthy. 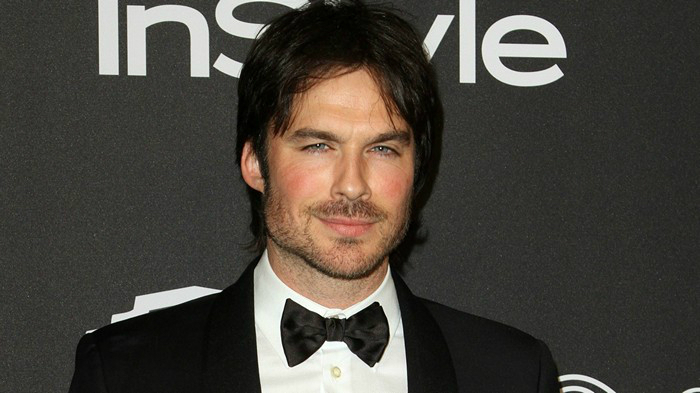 Somerhalder has endorsed many brands including Guess?, Calvin Klein, Dolce & Gabbana, Gucci and many others. Gained worldwide fame and massive fan-base for his role as Damon Salvatore in the TV drama The Vampire Diaries and Boone Carlyle in the TV drama Lost. His total net worth is estimated to be $8 million. He lives in a lavishly built house in Venice, California, which he bought in September 2015 for $2.9 Million. This eco-friendly home has three bedrooms, four bathrooms and 3,000 square feet of luxurious and expansive space. Because of his environment conservative philosophy he owns an Audi A3 E-Tron Electric car. He began his career as a model at the age of 10 and became an actor at 17. Soon, he established himself an actor becoming a popular face in Hollywood. He has 3 cats, named Miss Linx, Moke, and Thursday. He owns a pizza parlor along with his brothers in Idaho. He won many Teen Choice Award’s and a People’s Choice Award for his work in the TV series The Vampire Diaries. In 2010, Ian was named as the Sexiest Beast in an Entertainment Weekly Bracket Poll. He launched the Ian Somerhalder foundation in 2008 that aims at environment preservation and spreading social awareness about protecting the planet. Somerhalder is also a celebrity campaigner for RYOT, a Los Angeles-based media company.